The route out of Skipton at the start of Section Two of A Dales High Way climbs onto Tarn Moor by the Craven Heifer Inn. From here the route crosses a couple of fields to Bog Lane, following this a short way to enter the Yorkshire Dales National Park on a bridleway heading for the summit of Sharp Haw. Beyond the summit, with it's excellent panoramic views, the way drops to cross Flasby Fell, descending to the small farming hamlet of Flasby. There is an alternative lower level route here which avoids Sharp Haw and Flasby Fell, which may interest walkers in bad weather. There is also a link path which leads from the summit of Sharp Haw down to the lower level alternative, providing a quick and easy bad weather escape route, though it does involve a short section of path which is not a right of way. The lower level alternative turns left down Bog Lane for 200 metres to a wall stile for Flasby. The way now crosses fields parallel to the main route, picking up a firm forest track for 1¼ miles. The forest here has been recently cleared and excellent long views across Ribblesdale can be enjoyed. 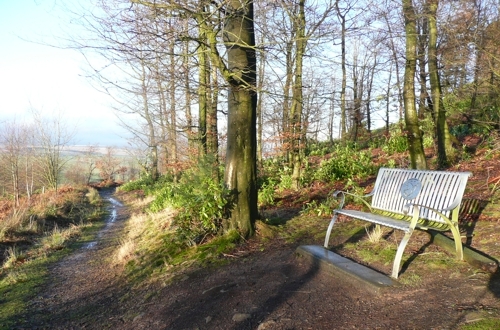 The route leaves the forest track to continue north through pleasant woodland, passing a memorial seat to Helen Handley, which is a great place for a break and marks the junction of the alternative footpath and the escape route from Sharp Haw. The way now descends across a field to cross Septeria Gill onto an enclosed track, before joining a farm access road which leads down to Flasby. In bad weather a quick escape route from Sharp Haw can be followed along the ridge, curving west as it descends to a gate at a wall corner. Beyond the gate a popular and well walked woodland track leads down to the Helen Handley seat, though bear in mind this short section is not a right of way. This avoids Flasby Fell which can become very boggy after prelonged and heavy rain. 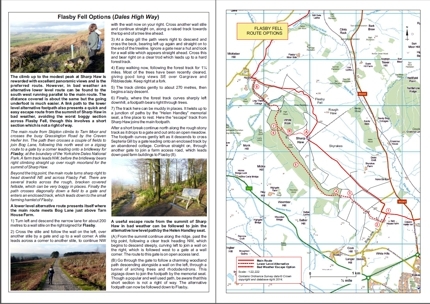 A map and route description of the Flasby Fell Route Options can be downloaded here (PDF format).